The preview issue I received last night is graced with two covers and they're both worthy of comment. 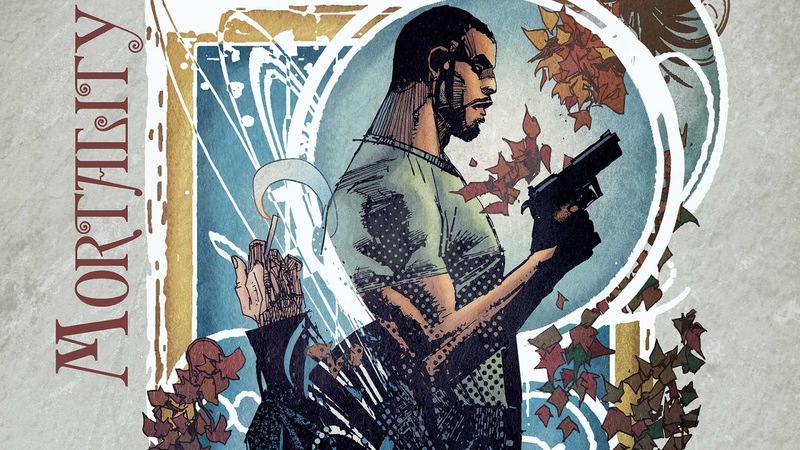 Series regulars Denys Cowan and Bill Sienkiewicz's cover is a playing card-style image with a gun-holding Cray in the ascendant, while Constantine, his trademark cigarette dangling loosely from his hand, is reversed underneath him. It's a bold dramatic image that hints at the magical shenanigans to come in this issue and, all told, it's probably the best of the Cowan/Sienkiewicz covers we've seen in this series so far. The Jamal Campbell variant is, if anything, even better. Cray is in a bathrobe staring moodily – and a touch murderously – at the reader while a stylishly dressed woman drapes her arm across his chest. Behind them is a shattered mirror in which Constantine is spectrally reflected, his right hand outstretched as if he's about to cast a spell. In the gap left by the broken glass of the mirror, the weird extra-dimensional energy that we've come to associate with Cray's sentient tumour glows and crackles ominously. It's awesome, poster-worthy and does a great job of portraying all but one of the key elements of this issue's story. Very very nice. But what about the story these covers represent? We were introduced to Constantine last issue and this issue starts with him testing an energy generator that appears to be powered by magic. 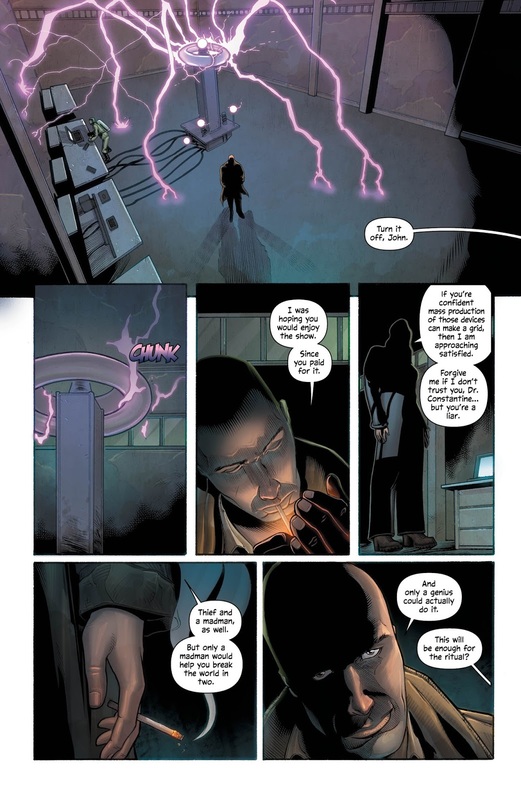 The test is observed by a shadowy female benefactor who has engaged Constantine to develop and use these devices to "help break the world in two". Dissatisfied with some of Constantine's more evasive answers to her questions about the device, she demonstrates her strength by throwing him across the room, but it won't be until this issue's final page before her identity is fully revealed. 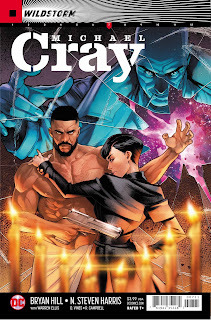 In the meantime, Michael Cray's having… control issues. He's in a hotel room in London, staring at his reflection in a broken mirror while he points a gun at his own head only to see it disintegrated by the tumour currently in residence there. Cray speaks briefly to Trelane before the narrative shifts to Constantine who is having his head shaved by a woman called Dion Fortune who is clearly Constantine's aide or friend. Constantine heads to his inner sanctum to consult with the dark powers that inspire him and it's clear straight away that, while this Constantine is very similar to the one with which we're familiar in the regular DC universe, he's much less reticent about giving his allegiance to demonic powers. Dion goes to visit Cray and invites him to join her boss for a drink. 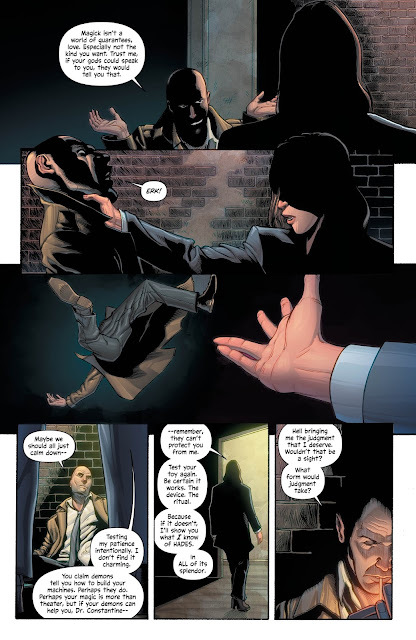 Sending Dion is a risky move on Constantine's part, but he's taken precautions prior to Cray's arrival – which includes a magic circle and the services of his client who turns up in dramatic fashion in the issue's finale. Because it is moving away from the infodump-heavy formula of the previous few issues, this story is already considerably better than what we've had so far. Unlike the Wild Storm universe's Oliver Queen, Barry Allen and Arthur Curry, Constantine is presented here as a formidable foe and, there's a real sense that, stripped of the largely pointless trappings of Trelane and his mostly anonymous back up team, Cray is facing a genuine challenge. That Cray has a voice in his head who is clearly desperate to kill Constantine only adds to the tension. Does the tumour see Constantine as a threat, someone who might be able to dislodge the entity from Cray's mind? There are intriguing possibilities here and, unlike the previous six issues, also a sense that those possibilities might be more than just interesting tidbits of background information, but actually lead somewhere meaningful. N Steven Harris' art is still a little rough at times, but anyone who wonders whether colourists can make a substantial difference to art should compare this issue with the previous one. Ross Campbell does a great job of adding depth and subtlety to the art here; I'd even go as far as to say that his work adds a whole half a point to my final score all on its own. Not that I'm inclined to be stingy this time around. With some of the elements introduced in issue 6 being intriguingly built on here and a rather shocking reveal at the end, this issue has got me excited about this series again. The tension between Trelane and Cray always seemed a little forced to me, but the tension between Cray and his mysterious tumour is much more meaningful and dramatic. Throw in a charming, psychotic and magnificently dangerous John Constantine and, although this issue is mostly set-up, it's hard not to be sucked in to the story. 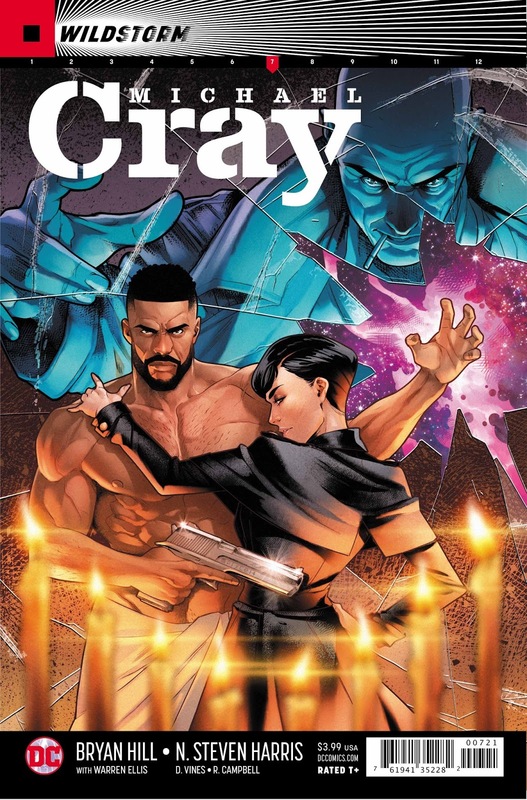 With an improvement in art (thank you, Ross Campbell) and a decisive break from the formula that has dogged the first half of this 12 issue series, this issue of Michael Cray is intriguing, disturbing and tremendously entertaining. Hill's characterization of Cray remains sympathetic and warm, but it's his Constantine who shines here. All told, this issue feels like, finally, the potential of this series is beginning to be realized.